Krupa CADD Solutions is pleased to announce an update to KCS Productivity Pack for AEC, v9.5.4, updated for compatibility with AutoCAD Architecture R2010-R2020. More information, and a free download, is available on the website. It will also be available at the AutoCAD AppStore soon. 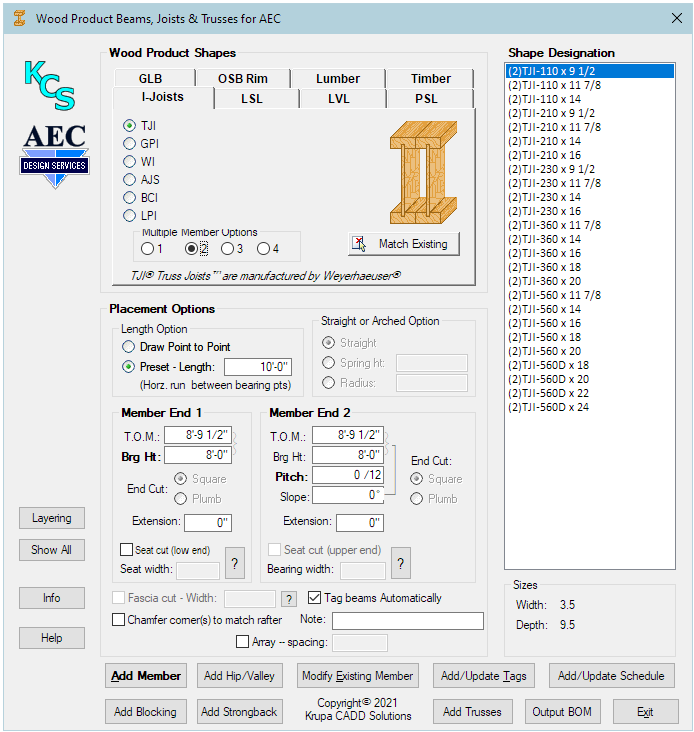 Krupa CADD Solutions is pleased to announce an update to Wood Beams, Joists and Trusses for AEC (formerly Wood Product Beams and Joists for AEC). Updated for compatibility with AutoCAD Architecture R2014-R2019, and now includes TRUSSES. More information, and a 30-day free trial, is available on the website. Krupa CADD Solutions is pleased to announce an update to KCS Productivity Pack for AEC, v9.5.3, updated for compatibility with AutoCAD Architecture R2010-R2019. More information, and a free download, is available on the website. Krupa CADD Solutions is pleased to announce an update to the KCS Batch Processing utility, designed to overcome the problems often encountered with other script-based batch utilities. This FREE utility is now compatible with any AutoCAD R2011-R2018. More information, and a free download, is available on the website. Krupa CADD Solutions is pleased to announce an update to KCS Productivity Pack for AEC, v9.5.2, updated for compatibility with AutoCAD Architecture R2010-R2018. More information, and a download, is available on the website. Krupa CADD Solutions is pleased to announce updates to two of its AutoCAD add-ons: the KCS Productivity Pack for AEC, and the KCS Productivity Pack (for Autocad). Both are updated for compatibility with R2017, including revised icons for proper display in R2017. In addition, the DimDot command has been expanded to incorporate the new AutoCAD capability of applying a linetype to a dimension extension line. But while doing so manually can be very cumbersome, especially with joined and stacked dimensions, this command makes it very easy! More information, and a download, is available on the website. Krupa CADD Solutions is pleased to announce the new KCS Batch Processing utility, designed to overcome the problems often encountered with other script-based batch utilities. This FREE utility is compatible with any AutoCAD R2011-R2015. More information, and a download, is available on the website. Krupa CADD Solutions, in association with AEC Design Services, is pleased to announce an update to Wood Product Beams and Joists for AEC module, v1.3, updated for compatibility with AutoCAD Architecture R2010-R2015. This module provides an easy way to create wood beams, joists, rafters, plates, hips and valleys, along with tags and beam schedule. This module provides not only the members, but also the MVBlock (tag), Property Set Definition, and Schedule table style. All this is contained in one dialog, accessed by one command - no need to access various palettes and ribbon tabs. All standard lumber sizes are available, in nominal, rough, and pressure treated varieties, along with engineered wood product members as provided by the major manufacturers. A multiple member option is provided for all member types that allow it. This module greatly simplifies the process of defining, placing, and scheduling these members. More information, and a free 30-day trial version, is available for download on the website. Krupa CADD Solutions is pleased to announce an update to KCS Productivity Pack for AEC, v9.3, updated for compatibility with AutoCAD Architecture R2010-R2015, and now including alternate icons for the R2015 Dark color scheme. It also works with AutoCAD MEP. More information, and a fully functional free version, is available for download on the website. Krupa CADD Solutions is pleased to announce an update to KCS Productivity Pack for AEC, v9.2, updated for compatibility with AutoCAD Architecture R2010-R2015. It also works with AutoCAD MEP. More information, and a fully functional free version, is available for download on the website. Krupa CADD Solutions, in association with AEC Design Services, is pleased to announce an update to Wood Product Beams and Joists for AEC module, v1.1, updated for compatibility with AutoCAD Architecture R2010-R2014. This module provides an easy way to create wood beams, joists, rafters, plates, hips and valleys, along with tags and beam schedule. This module provides not only the members, but the MVBlock (tag), Property Set Definition, and Schedule table style. All this is contained in one dialog, accessed by one command - no need to access various palettes and ribbon tabs. All standard lumber sizes are available, in nominal, rough, and pressure treated varieties, along with engineered wood product members as provided by the major manufacturers. A multiple member option is provided for all member types that allow it. This module greatly simplifies the process of defining, placing, and scheduling these members. More information, and a free 30-day trial version, is available for download on the website. Krupa CADD Solutions is pleased to announce an update to KCS Productivity Pack for AEC, v9.1, updated for compatibility with AutoCAD Architecture R2010-R2014. It also works with AutoCAD MEP. More information, and a fully functional free version, is available for download on the website. Krupa CADD Solutions, in association with AEC Design Services, is pleased to announce the release of its Wood Product Beams and Joists for AEC module, for use with AutoCAD Architectural or MEP (R2010 - R2013). This module provides an easy way to create wood beams, joists, rafters, plates, hips and valleys, along with tags and beam schedule. This module provides not only the members, but the MVBlock (tag), Property Set Definition, and Schedule table style. All this is contained in one dialog, accessed by one command - no need to access various palettes and ribbon tabs. All standard lumber sizes are available, in nominal, rough, and pressure treated varieties, along with engineered wood product members as provided by the major manufacturers. A multiple member option is provided for all member types that allow it. This module greatly simplifies the process of defining, placing, and scheduling these members. More information, and a free 30-day trial version, is available for download on the website. Krupa CADD Solutions is pleased to announce the release of an update for its KCS Productivity Pack for AEC. These programs are now updated for compatibility with R2012 (as well a previous AutoCAD versions), and for 64-bit systems, including Windows 7. KCS Productivity Pack for AEC is now compatible with AutoCAD Architectural (formerly Architectural Desktop) R2004 - R2012 It also works with AutoCAD MEP (formerly Architectural Building Systems). KCS Productivity Pack for AutoCAD is compatible with plain AutoCAD or any vertical application other than the Architectural and Building versions. This program is compatible with AutoCAD R2000 - R2012. Additional info and downloads are available on our web site.